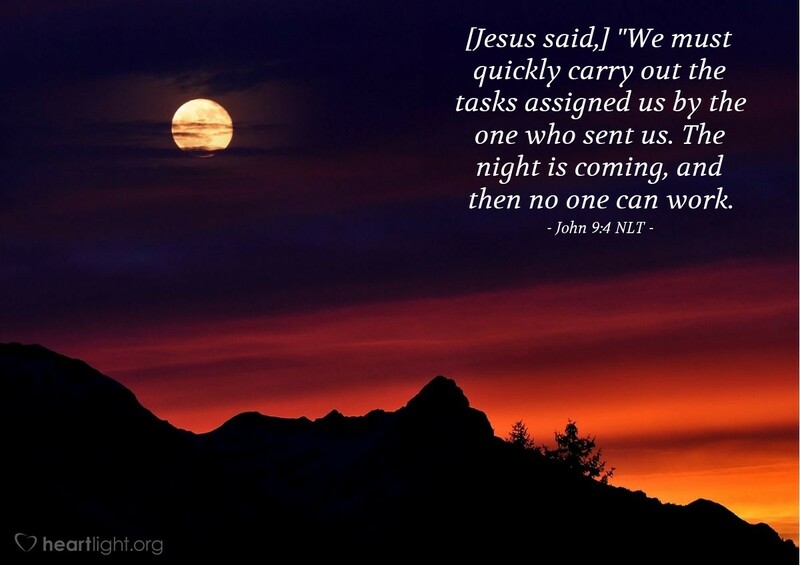 [Jesus said,] "We must quickly carry out the tasks assigned us by the one who sent us. The night is coming, and then no one can work. Jesus recognizes that his time on earth is short. He feels a sense of urgency to get the work of God completed. He also shares the importance of getting that work done with his disciples. Many of us have all sorts of distractions crowding into our lives. Some of these distractions seem important to us. Others, we recognize as insignificant intrusions. The real question, however, is this: How well are we doing with placing God's priorities first in our lives regardless of the apparent importance of possible distractions? Do we feel a sense of urgency to get God's work done? Is God's work our focus or just another item to check off our "to do" list crowding into our busy lives? Holy God, help me better know how to order my priorities. Please help me be more confident of the things you want most for me to do. Father, I gladly submit my will to be led by your Spirit and to live for your glory. Please guide my way. In Jesus' name, I ask it. Amen.